Attention! Competition!!! 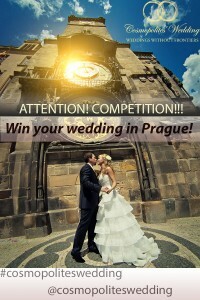 Win your wedding in Prague! For the tenth anniversary of our company, we decided to organize a Competition that will allow you to win your wedding in Prague in 2017. 5. Your Instagram profile should be open for the duration of the competition! 6. The winner will be selected on the 1st of January 2017 from the 10 contestants with the highest number of likes of this post in your Instagram! Moreover the participant №1 will be the competitor with the highest number of Likes. Wedding in the Old Town Hall, Nuselska Town Hall or Chateau Liben. Our wedding agency will provide 2-3 choices of the dates to choose from. Prize is not transferable to a third party, and may be used until the end of 2017.
extra payment for the wedding ceremony at the Old Town Hall on Thursday and Friday after 1:30 pm — 40 EURO. extra payment for the wedding ceremony at the Nuselska Town Hall on the working day after 1:30 pm — 40 EURO.